Like Krishna's gopis, Andal had conquered Vishnu by her love and devotion. Her father was Periaazhvaar, a Vishnu devotee, who found her abandoned at the Srivilliputtur Vishnu temple when she was young. As she grew older, her love for Vishnu deepened. One day Periaazhvaar found her wearing the garlands of the temple's deity. When he asked her, she said, "I am wearing the god's garlands whom I shall marry." Angry, Periaazhvaar made fresh garlands. That night Vishnu appeared in his dream and said that he would only accept the garlands that Andal had worn. 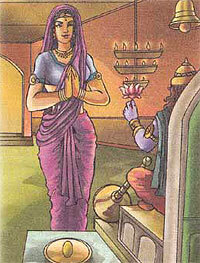 Now Andal understood her divine nature and offered her at the Ranganatha temple at Srirangam. Ranganatha is another name of Vishnu. While she was being offered, Andal disapeared and merged herself with the idol. Andal is also known as Goda, or Bhuma devi .